Scrap This, Save That: Okay, Back to Business! Good morning bloggers!! I hope today finds you rested and refreshed. It's time to get back to the business of crafting and blogging...for me anyway. So today I have another post on the calendars I made for my kids for Christmas. You can scroll down to last week's posts if you missed any of the other months so far, and are interested in seeing them. For the months of July and August, I made the kid's pages almost identical. I just found something that worked and rolled with it! The background paper for July was some handmade paper that came in huge 2x4 foot sheets.We found it at an AWESOME art shop in the University District in Seattle, that my daughter took me to a while back. 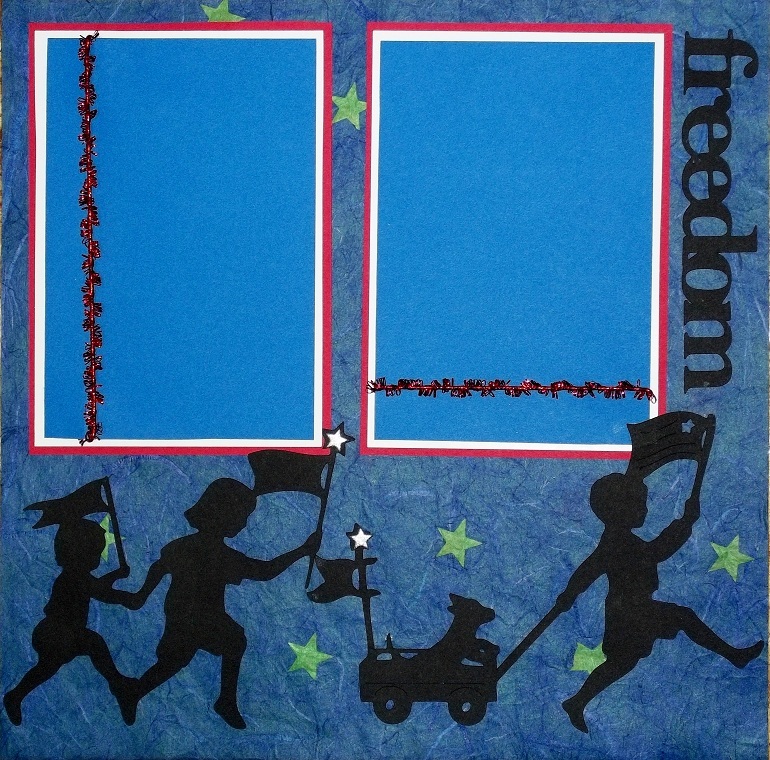 The blue paper has stars cut out, and you can see the green paper peeking through from the other side. If you turn it over, the page is green with blue stars peeking through...very cool! 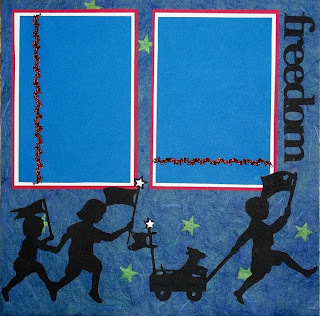 The word, "freedom" was cut from the Graphically speaking cartridge, and the kids were cut from A Child's Year. I never really thought I would have much use for that cartridge since my kids are all grown, but it amazes me how much I love it and use it! August made me think of camping trips, and this is the page that materialized! I really love how it came out! 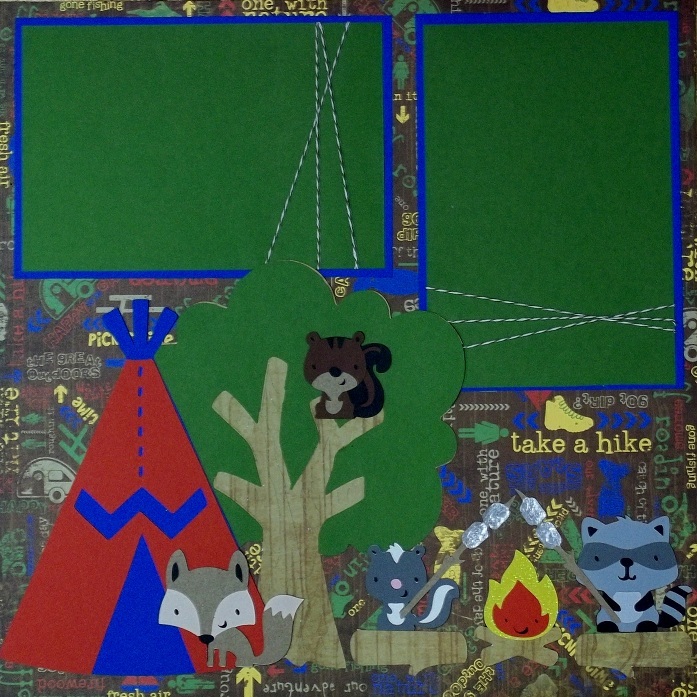 The background paper is from Bo Bunny and the reverse side is the wood grain pattern that I made the tree and logs with. Of course there's lots of little critters camping and roasting marshmallows too! 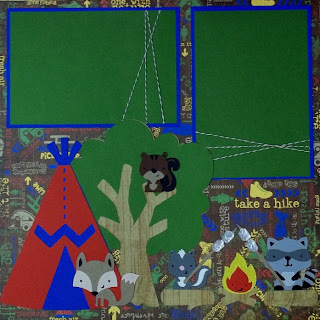 Most of the cuts are from the Create-A-Critter cartridge, and the tree is from Everyday Paper Dolls. A little twine on the picture mats completes the outdoorsy look! If you're a football fan, make sure to come back tomorrow to see what I did for the September pages!! Your calendars must have been fabulous because each page looked great. These are amazing, i love the August one, those littling camping critters are so cute, can't wait to see sept. and oct.! !